HÀ TĨNH — A librarian in Hà Tĩnh Province has devoted herself to brining the joy of reading to disadvantaged children in remote areas. “When I’ve had troubles in life, they (books) are the friends that comforted me and gave me the energy to keep going,” librarian Nguyễn Thị Hằng says. That is the simple reason Hằng, who works at Kỳ Anh Town’s library, has been collecting books to donate to poor children every day. Born in 1987 in Kỳ Văn Commune (Kỳ Anh District), Hằng grew up with the typical difficulties of rural kids. The spiritual lives of poor people was always lacking and “reading was a luxury”. From a young age, Hằng had a passion for books and this passion brought her to a job as a librarian at Kỳ Anh Town library. 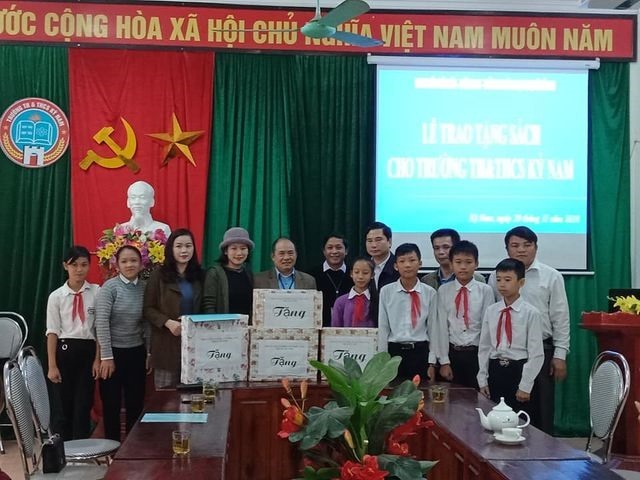 On a trip in 2017, Hằng gave presents to poor students in Kỳ Ninh Commune (Kỳ Anh Town) after a storm, and heard from their teachers about the lack of books. She then started a plan to collect and donate books to poor students. Hằng’s book collection journey started from her old books and took off when she took her cause to Facebook. When she first started donated books two years ago, she received nearly 200 old and new books from her friends. The first school she went to give books to was Kỳ Ninh secondary school. Seeing children’s joy when receiving books, Hằng was motivated to redouble her efforts. Since then, she has taken every opportunity possible to collect more books. “Many book donors have been with me from the start,” Hằng said. Her dedication knows no bounds: Hằng and her husband will often wake up at 3am to collect donated books sent via passenger buses. Then Hằng and her colleague Đào Thị Vân meticulously classify the books and pack them. “My work is supported by my husband and library leaders and colleagues are very interested in and regularly help me on my book donating journey,” she said. From late 2017 to now, Hằng has received 20 donations with more than 2,000 new and old books to provide for seven communes in Kỳ Anh Town. Looking at her face with her easy smile, few people would realise the hardships Hằng has been through. Hằng’s father died early when she was six-year-olds and her brother was 10, leaving her mother to raise two small children in poverty. In 2015, when Hằng was pregnant with her second baby, her mother died. The psychological shock caused her to give birth prematurely. “It was a time when I was very sad and depressed. I was unemployed with two small children while my husband’s salary was too little to support my family,” she said. “During that time, I regularly read books about poor but talented people. I found many people had it worse than me. That helped me up and keep going,”she said. Early in 2017, she was hired as a librarian at Kỳ Anh Town’s library.